When compared with a double glazed unit, a triple glazed window incorporates an extra pane of glass and additional insulating cavity space so its energy efficiency is greater. 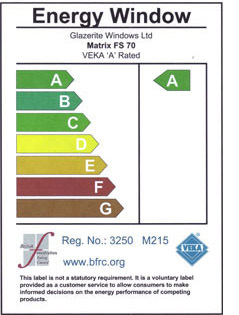 A double-glazed window containing Planitherm can easily achieve the minimum required "C" rating or step up to an "A" rating for superior energy efficiency. Due to its unrivalled balance of solar heat gain and exceptional thermal insulation, it is possible to exceed the "A" rating with triple glazing - achieving energy ratings of up to +20 to +30 kWh/m²/year. This means that your windows actually allow much more heat into the home than it loses, helping to heat your home for free! According to the GGF Energy Savings Calculator, "A" rated windows could save you up to £3910 on your energy bills and 17.5 tonnes of CO2 over the next 10 years*. Triple glazing is up to 40% more thermally efficient so the savings will be much higher. This can be illustrated when considering the U-value measure. 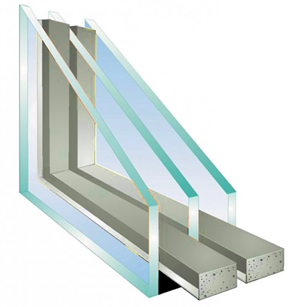 A U-value demonstrates the thermal insulating performance of a window. The lower the figure, the better the insulating performance. Today, a window must have a minimum U-value of 1.6Wm²K to meet building regulations. An energy efficient double-glazed unit containing Planitherm glass can achieve around a whole window 1.4Wm²K U-value. A triple glazed window can achieve a U-value as low as 1.0Wm²K, which could save you a significant amount on your energy bills through reduced heat loss from your home. * Based on a semi-detached property removing single glazed aluminium frame windows and replacing them with A rated windows with a 3% inflation factor. For information on energy ratings click here. For Energy saving FAQ click here.